ELVIS, RIGHT? HE LIKES ELVIS? Does the guest of honor identify himself with a certain era? Can you pin him to one? Makes a great Over the Hill cake idea! Create a cake theme as general or as specific as required. If you have a picture of the guest of honor with big hair, it should go on the cake. See this mountain-hill thing on my cake? That symbolizes the hill that you’re over. Anything more than five years old already seems like it’s from olden times, so pick freely among the cultural touchstones: cartoons, TV shows, music, movies, plays and operettas. Or just go with sports. If he’s a Lions fan, your problems are over. There’s an awesome cake on the Cake Central.com website — a tape cassette, created really well. There’s even a loop of excess “tape” spilling out of the cassette. That’s gonna get a smile out of anyone with a past of fiddling with music tapes. Try pulling off that idea with cakes made/decorated to look like turntables and records (easy, right? ), Victrolas, old time radios, old cars, etc. Just be sure you can pull off the look of your item with enough realism to make it instantly recognizable. It loses impact if you have to explain that the misshapen rectangle on the cake is a Nakamichi four-head recorder. 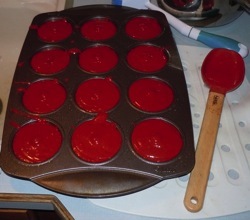 Step 8: Pour the batter into a pre-greased cake pan and… what the hell? That’s not a cake pan! It’s not even a cupcake pan. It looks like something you use to make muffins or small bundt cakes. Oh, what’s the difference. It’s a cake pan, alright? Let’s keep going. 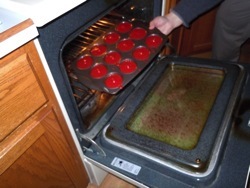 Step 9: Place the “cake pan” into the preheated oven. Do not comment on how greasy the oven looks or it will be your job to clean it. Baking times vary by the type of pan you use. Our ridiculous muffin pan needs only 19-22 minutes of baking. A 13 x 9 inch pan or two eight-inch round pans would need 35-38 minutes. Next step. 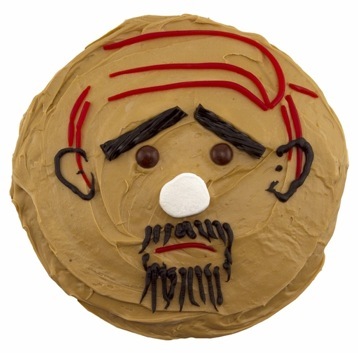 If you’d like to put real honor into the guest of honor’s cake, commemorate something he finds important in his life. For example, if he was a military man, accurate replicas of his badges, ribbons and insignia would make fine decorations. Are there other momentos of his life or work that help sum up what he’s about? Cake it up! Just because you’ve thought of a cake idea that is both cool and undisgusting doesn’t mean your job is over. There are a few more letters in the CATFWP mantra that need to be addressed. Read on.